Tandem jumps for you, choose from 9 airports in the Czech Republic. New technologies and materials used in parachuting have significantly eliminated malfunctions of parachuting equipment. Thanks to this parachuting has become accessible for wide public. During a tandem skydive you will be securely strapped to the harness of a tandem master, which has a carrying capacity of 6 tons. The one risk that remains is the human factor. Our instructors and tandem masters belong to the elite not only within the Czech Republic, and they were the first ones to get authorization for tandem skydives. Our rich experience and many years of service then enables us to claim that our tandem skydives are safe and suppress all risks to the minimum. There is none. We have already jumped with 8-year-old kid, just like with an 87-year-old lady. I weight 110 kg and would like to jump. Is it possible? Yes, we will jump with you. The parachute is designed to carry even bigger weights. The client’s weight is rather important for tandem masters, as they carry the whole of it during some sequences of a jump. Yes, there are restrictions. Before you jump, you have to fill in and sign a waver, where you state you don’t suffer from any serious disease such as hart disease, epilepsy, diabetes, etc., or you did not have a serious accident that would disable you from jumping. However, a medical checkup is not necessary for tandem jumping. Can I jump with glasses or contact lenses? Yes. We will provide you with protective freefall goggles, available in different sizes. How does freefall feel? Can I breath in freefall? Freefall is above all a great deal of adrenalin. You will experience moments many people cannot even imagine, and there is no other way how to get them. The freefall will take around 1 minute at the speed of 200 – 250 km per hour. There is no need to be afraid of falling, the sensation is more like flying, as you are your own wings and the air serves as a cushion. Freefall thrill will get into each and every part of your body, and it is the biggest exhilaration you can imagine. You may find it more difficult to breathe in freefall, but this is just a deceptive sensation. Freefall will free you from absolutely all everyday worries and frustrations! What am I expected to take care of during the jump? How do I have to behave? Will I manage it? How long can freefall and canopy ride take? Can we chat during the jump? Freefall takes approximately 50 – 60 seconds, the canopy ride around 6 – 8 min. You will not be able to talk in freefall, as there is a significant amount of aerodynamic noise. Once the parachute opens, everything goes quiet and you will feel absolutely peaceful. After that you can start chatting with your tandem instructor. We can actually hear most of our clients on the ground when they are still in around 1 km! What happens if the parachute does not open? Tandem parachutes are specially designed for two persons. Each parachute contains the set of main and reserve parachutes, which is opened in case of emergency and which can take you to the ground as safely and as comfortably as the main one. Moreover, each parachute has a CYPRES, an automatic activation device, which constantly evaluates your situation and will open the chute in case of emergency without any assistance from the tandem instructor. Besides, tandem instructors are equipped with acoustic and analogue altimeters. How hard is the landing? Don’t worry. Picture the landing with our masters as a fall from about 10 – 30 cm. Conservative engineering of tandem parachutes enables them to carry more than two persons typically weight. Thanks to this we can land even with physically disabled people without any troubles. What shall I wear for the jump? There is no special gear you need for tandem skydiving. Nevertheless the spring to fall temperature at 4000 m varies from –10 to +10 °C, therefore we recommend that you wear comfortable underwear and clothing, such as tracksuit and trainers (the latter being more suitable than hiking boots). We can also provide you with a jumpsuit, goggles and leather helmet. Will I get some kind of certificate about the jump? Yes. After you jump you will receive a certificate confirming that you have done a tandem skydive. If the weather does not permit jumping (when rain, heavy low clouds or strong wind occur), we will inform you as soon as possible not to make the journey to the airport. Unless we do it, we recommend that you came. Depending on the weather conditions, the time of your jump may be postponed till later in the day or we can arrange another date after mutual agreement. Can you record my jump? We definitely recommend you to opt for recording your jump. With a VHS or DVD video you can share the unforgettable, exhilarating experience with all your friends. If you wish, you can add high quality still pictures to your package. A professional cameraman will follow you when you do your training, when you jump and freefall, and only a while after the landing you will get a high quality record with sound and/or photos. Can I drink alcohol before the jump? That is certainly not recommended. From what kind of airplane do you jump? I get air sick when flying. At most of the airports we use a twin engined short-range high wing monoplane L-410. This plane flies at fast and steady speed. Occasionally we can jump from a helicopter Mi-8 which is certainly an unforgettable experience for anyone. At Horovice Airport we also jump from a biplane AN-2. The climb takes 15 – 25 min. You don’t have to be afraid of air sickness – a flow of fresh air will take care of your wakefulness and fitness. Why should I jump and why in tandem? We guarantee your tandem jump will fill you with brand new life energy and all your mundane worries and frustrations will seem petty. You will get a whole load of self-confidence and a new appetite for life. No other sport or activity will bring you such an intensive experience! How and where can I order a jump? You can order either a jump for yourself or a gift certificate – a voucher you can give to somebody else. I don’t know what date would be convenient for the gifted person. When buying a jump certificate you don’t need to arrange a date of the jump. The gifted person will do this as soon as he contacts us. 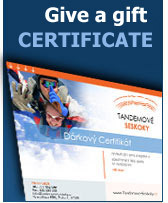 How can the holder of a gift certificate book the jump? Simply call the info line (777 062 699), the number is written on the gift certificate. Then you can set a date and location for the jump that will be convenient for you. How much time ahead do I have to order the jump? Ideally you will book the jump at least 14 days in advance. Nevertheless, we will always do maximum to meet your expectation in terms of both, date and location. I have already ordered my jump but I found out I will not be able to attend it. What shall I do? As soon as you find out you will not be able to come, please inform as immediately so that we can postpone it. Is the gift certificate transferable? Yes, in case you cannot redeem your gift certificate, you can give it to somebody else even though it states your name as the name of the person that will jump. I got a gift certificate but I cannot redeem it or give it to anyone. Within 1 month after the date of the order you can send the gift certificate back to our address: Odyssey Group, s.r.o., Svornosti 30, 150 00 Praha 5, and we will wire your money back to your account. In case you hold the gift certificate for more than 1 month, you still can give it to anyone. In that case you can send it to us and we will issue a new one, with the new name of the person that will do the jump. When does the gift certificate expire and till when can I return it? The gift vouchers are valid for 1 year starting from the day of issuance. Similarly, it can be returned within one month. Once we receive it, we will wire your money to your account. We are a group of more than 5 persons and we want to jump. Do we get a discount? Yes, we offer discounts for groups of 5 or more. Our Price List is available here. Take advantage of the discounted price! In 2018, we jump every weekend from April to November!!! NEW – tandem jumps in city of MOST and HRADEC KRÁLOVÉ! We jump from Turbolet L-410, AN-2, MI-8 and PAC 750! Book you tandem jump NOW before it is too late! Thank you so much! It was just amazing! Pete from Levice. Superb experience, so cool. Thanks, Robert. This was the first time in my life I had a guy clinging onto my back. It was cool, all the way down. Thanks, thanks, thanks… Pavel K.